Playing without star quarterback McKenzie Milton, UCF knew it was going to take everything it had to get a win against Memphis for the fourth time in a year. Darriel Mack, who had been elevated to the starter after Milton’s injury, had a spectacular outing. He threw for 348 yards and two touchdowns, as well as rushing for two touchdowns as well. Greg McCrae also had a huge night, rushing for 206 yards and a touchdown. In the first half, UCF looked more outmatched than it had in the last two years. The defense simply had no answers for Henderson, who rushed for two massive plays in the first quarter alone. He went into halftime with an astonishing 207 rushing yards and three rushing touchdowns. Meanwhile, UCF’s offense also struggled throughout the half. 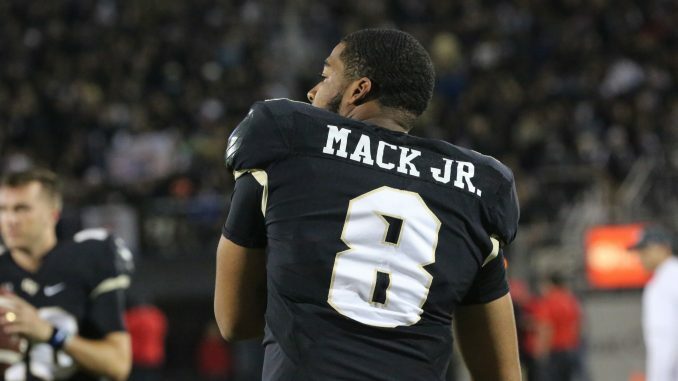 Mack fumbled three times, and the Knights simply couldn’t consistently move down the field. It seemed that every time UCF caught a break, something went wrong. With a couple minutes left in the first half, Memphis was set to punt to UCF, which was down by 10. But Otis Anderson fumbled the punt, and it was recovered by the Tigers, allowing them to quickly score to go up 38-21 at halftime. But UCF looked like a different team coming out of halftime. Mack looked more confident, the defense was more solid, and Memphis was suddenly playing a close game. The Knights outscored the Tigers 14-3 in the third quarter, and off a touchdown run by Mack at the start of the fourth, took a one-point lead. In the fourth quarter, UCF managed to add to its lead after a missed Memphis field goal. The Knights drove down the field and Mack ran it in once again, putting his team up 49-41 with around six minutes to go in the game. Mack went on to run another touchdown in for the Knights, putting UCF in a commanding 15-point lead with two and a half minutes to go. But the Tigers couldn’t respond, and the Knights went on to win their second straight conference championship. UCF will find out tomorrow what New Year’s Six bowl it will play in.